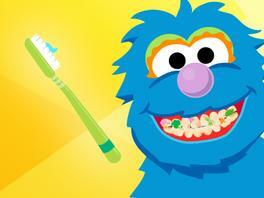 Practice brushing teeth with Guy Smiley. Help your child learn to take good care of her teeth. Brush them all over in small circles twice each day! Eat your colors every day. Some foods can help your teeth be strong.